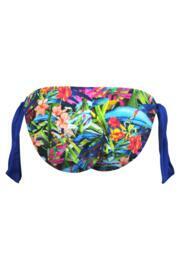 The design of the Costa Rica Tie Side Brief allows means you can achieve the perfect fit to these cute bikini bottoms. Styled with contrasting side ties to the luxe tropical print, they’ll flatter and elongate your legs beautifully. Well cut, just the right size. Bows at the side are gorgeous and eye catching. Fabulous colours.